Additive manufacturing is more and more used in the automotive industry. This 3D technology is useful on many levels, from the prototyping process to the production of car parts. Even if we are still waiting to see a fully 3D printed car on the road, we can now say that the automotive industry is really getting closer to this project. From classic vehicles to customized cars, a lot of new projects can now be produced using 3D printing. Bugatti, the French automotive manufacturer, actually included some 3D printed car parts to its new car, the Divo Supercar. We will tell you everything about this new project developed by the luxury car maker in this blog post! Additive manufacturing can be really useful in the automotive industry. Indeed, it is the perfect way to create prototypes, to work on car design or manufacture functional car parts. The 3D printing technology is really becoming a great help for the automotive industry. Indeed, it helps the product development but it is also a great way to save money on different levels in this sector. You now know that it is possible to 3D print car parts, but 3D printing can also be helpful for the manufacturing process by itself. For example, Volkswagen Autoeuropa, the car manufacturer, is using 3D printing to manufacture some of its tools. The company estimates that thanks to their use of additive manufacturing, they saved 250,000€ in 2017. This technology can clearly help to reduce the tooling investment of car manufacturers. 3D printing is also a new way for car manufacturers to develop brand new projects. 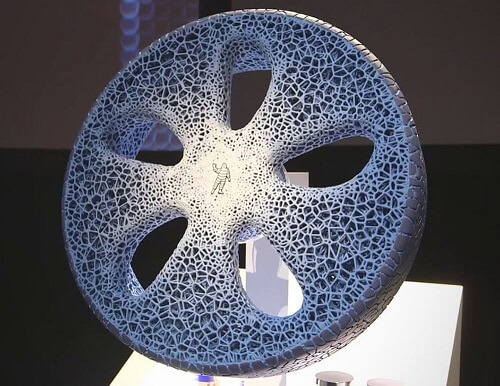 For example, we recently talked about the promising 3D printed tires created by Michelin, a new innovation allowing to avoid some traditional tire problems, like low pressure, blowouts, and diverse safety problems. Additive manufacturing is offering new interesting possibilities in terms of car equipment thanks to new 3D printers and materials. As you can see, this cutting-edge technology can be used for various applications in the automotive sector. 3D modeling software and 3D technology are allowing to work on any design, to rapidly prototype or to create a final product. If you have an automotive project and need software to begin and start your 3D design, here is our selection of the best CAD software for the automotive industry. 3D printing also means more freedom, especially when it comes to the design of the car parts. It is perfect to modify the design, easily allowing mass customization for example. It is the best method to work on the structure of the parts and improve them. For example, it is possible to use this manufacturing method to reduce weight of the parts or to reduce the material loss, as you only use the amount of material that is needed for the project. Plus, lighter products and less material used also means a lower budget to manufacture your parts. 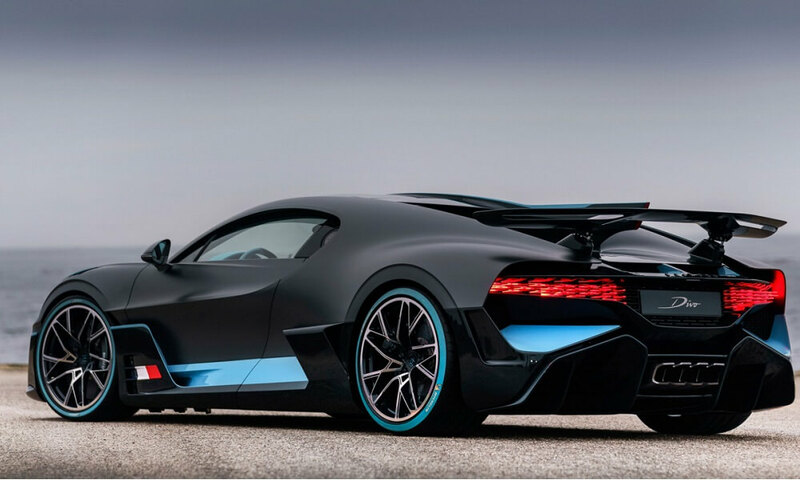 If Bugatti used the additive manufacturing technology for the creation of this car, it is precisely because they wanted to reduce the weight of their parts. 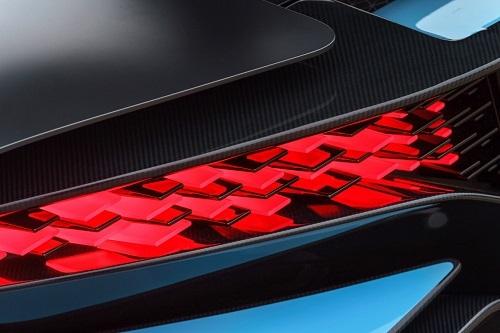 They 3D printed fin rear lights for this vehicle, making them lighter than the previous Chinon model. Reducing the total weight of the car parts and of the whole car can totally improve its performance. Bugatti President Stephan Winkelmann states that this new Divo Supercar really has higher performance in terms of acceleration and agility. It is even more aerodynamic than the previous model, and really faster. We can also say that these parts are really matching the global aesthetic of the car, and of the whole brand. Additive manufacturing is also a great manufacturing method for small production runs. Bugatti only needed this part for 40 cars and in these cars, 3D printing appears to be a perfect solution, allowing to print several parts for an advantageous price. It is not the first time that Bugatti includes 3D printing in the manufacturing process of one of their cars. Indeed, the manufacturer, developed 3D printed brake calliper for Bugatti Chiron, their previous model. As their first use of 3D printing was quite promising, we can assume that more and more car manufacturers are now willing to use this technology, and that they will also begin to use it to print small but also bigger parts. Additive manufacturing is particularly efficient in this sector, enabling the improvement of car structures. Car manufacturers are starting to really make the most of 3D printing, to build classic cars or more extraordinary projects like this Divo Supercar. 3D printers are now allowing to create qualitative parts and to build project even more easily and wit a lower budget than with technologies such as injection molding. If you want to start an automotive project using this technology, don’t hesitate to upload your 3D file on our online 3D printing service or, if you have any question, contact our sales team. For more informations about 3D printing in the automotive sectors and lhe latest news in the 3D printing world, subscribe to our weekly newsletter.